Disneyland does it, and top children's shops do it, so why not do it yourself? A glitter accent wall can brighten up a room. It adds texture, depth and a unique statement to any room. The glitter accent wall can be found in shops and hotel rooms around the world. It is making its way into homes via DIY glitter paint. If you use the right tools and product, then DIY glitter paint is relatively easy to mix and roll on without worry of cracking, peeling or bubbling. Glitter paint additive is an affordable way to get a professional look for a glitter paint accent wall. They come in powders that can be mixed into nearly every type of paint without compromising the compound. They work with matte emulsions, water-based wood varnishes and most stains and sheen varnishes. A glitter paint additive is versatile in its color and sparkle quotient. It is easier to control the amount of glitter you want to appear on the walls. You can create a thick slick of colorful, glittery mixture for your walls by pouring handfuls of a shiny powdered additive or a mere dusting of shimmering glitter to your favorite color, brand or finish of paint. It might seem that simply buying a can of glitter paint would be the easiest way to go. It is packaged as ready to roll onto walls or other primed surfaces just like any other paint. The upside to painting with glitter already added to the product is that you simply pop the lid of the can and begin applying the paint to clean walls. The downside to cans of premade glitter paint is that most glitter paints are translucent and ready to roll onto prepainted colored walls. 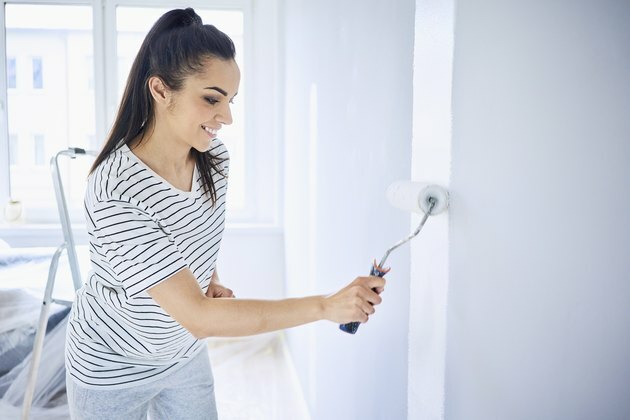 Paints with added glitter may need a second coat to achieve the correct color you desire, which doesn't allow you to control the level of glitter that you put on the walls. There are a few ways to achieve the look on your own. To make your own glitter paint, add your favorite glitter to Mod Podge or clear glue. Use two parts of glitter to one part of glue or Mod Podge. 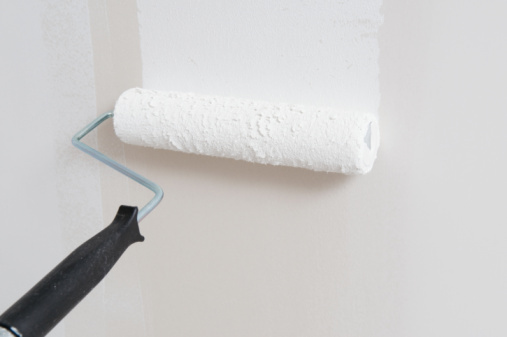 This will have a very thick consistency, so use a wide paint brush rather than a roller to apply the mixture to the wall. If you have just painted a wall, you can blow glitter onto the wet paint. This will create thick swaths of glitter in areas rather than an overall even glitter effect. Use spray glue on the walls and blow glitter onto the glued areas. This treatment is best for small areas. Using glues requires a lot of ventilation, so keep windows open or fans on that are directed away from the walls where you are applying the glitter. For the best result, use glitter that will contrast well with the current color on the walls. If you use a shimmering silver glitter on white walls, then it may take many coats to achieve the level of sparkle for which you are hoping. Always lay down tarps over the flooring and tape off any edges that you don't want to have smeared in glitter. If the sparkle is instantly over the top, wipe the wall down with a clean roller or brush. The bristles or sponge will pick up the larger pieces of glitter from the surface and reduce the glimmer. A glitter paint accent wall is lovely, but if it feels like it may be too much, you can start small and build up to an entire wall. A stripe of glitter paint at the midpoint of the wall adds an unexpected bit of bling to a bland space. A window trimmed in glitter paint can bring a focal point to a small room.